One of the UK‘s most buzzing and multicultural cities, Bristol’s food scene is particularly famed for its ethnic diversity, fascinating choices, and quality local ingredients. Whether it’s Lebanese mezzes, Caribbean grills, or dainty English cakes you’re looking for, you’re sure to find it in Bristol. Here are 10 of the best restaurants in the city. This stall regularly makes an appearance at the St Nicholas and Temple Quay food markets, much to the delight of the Bristol locals. Satiating hunger since its first appearance in the city, Niangs has been cooking up a storm ever since. Traditional Thai cuisine transformed into healthy, organic treats – it’s not hard to see why this pop-up is such a local favourite. The emphasis here is on authenticity and all the dishes are the result of recipes that have been handed down from mother to daughter for generations. Find them at: Temple Quay Food Market, St Nicholas’ Market and at other events round the city. The aromatic scents wafting out the door of this Bristol takeaway simply invites customers in, leaving passers-by helpless to the temptation of coming to try the host of authentic Indian dishes on offer. With gluten-free, vegetarian, vegan, and meat options available, the menu at Tiffins truly caters to all. The husband and wife team behind Tiffins have been making waves in Bristol’s Indian scene since 2003 and their dazzling fusions of flavors have earned them many dedicated fans in the city. This regional Gujarati cuisine is famed for being healthier and more nutritional than traditional Indian cooking. If the heavenly taste of Ahh Toots‘s home-made sweet treats and wholesome savory snacks isn’t enough to tempt you to this permanent fixture in Bristol’s St Nicholas food market, the exquisite presentation of everything here is sure to do the job. With each dish practically acting as a work of art in itself, you’ll have to fight the desire not to spoil the beautifully delicate creations with the craving to sink your teeth into those tasty treats. Home-made soups, buttery croissants stuffed with gourmet fillings, and those gooey cakes…Ah Toots is a true foodie heaven in the heart of Bristol. Unlike Tiffins, Gopal’s doesn’t have a permanent location, but making sure to catch these guys at one of Bristol’s fascinating food fairs, or in one of their regular pop-up locations is certainly worth the effort. With its entirely vegetarian menu, sole use of local, organic produce, and emphasis on recyclable materials, Gopal’s ethical principles are evident in all aspects of their business. The ingredients of these delicious curries reflect the best of the British seasons and are guaranteed to be bursting with freshness. Love and principles also shine through in the food’s stunning flavours and delicate spices. Crispy spinach and sweet potato pakoras, piquant vegetable curries, sweet mango lassi, beetroot samosas, and spicy chai brownies will leave your mind boggled about where to start on this incredible menu. 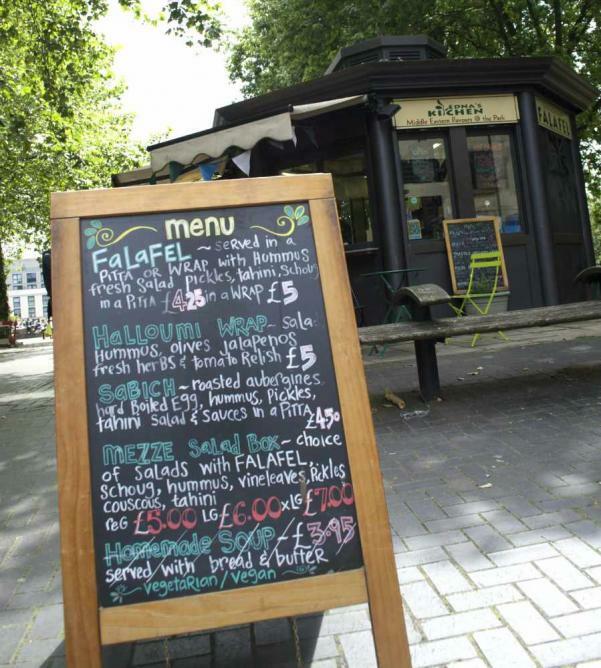 Falafel is no light matter in Bristol, and for true Middle Eastern food lovers, any trip to Bristol is not complete without a pilgrimage to the haven that is Edna’s Kitchen for a taste of what is considered to be the best falafel in the city. This hexagonal shack is a little corner of the East in the middle of Bristol’s Castle Park. Come and admire the park’s lush greenery while tucking into the plentiful choice of Mediterranean and Middle Eastern delights on offer at Edna’s. Despite a somewhat limited menu, visitors to this stand in Bristol’s fantastic St Nicholas market certainly won’t be left disappointed. After choosing one of the slow cooked briskets or rolls, dig in to the juicy meat, and watch out for the drips of deliciously smoky sauce oozing from the soft buns. The 18 hours spent cooking the pulled pork roll attests to the care and expertise that defines the cooking here at Grill Stock. Served up in exceedingly generous quantities, for meat-lovers seeking a hearty and delicious lunch in the city center, there’s really no better choice. The passion of owner Darrin Dart for Vietnamese street food was the inspiration behind this Asian pop-up. Zestiness, tang, spice, sweetness…every mouthful of the Vietnamese delights at Viet Vite is sure to be an adventure. Let the aromatic phos, and crunchy noodle salads transport you far away to Asia. With fascinating creations such as Asian scotch eggs, innovation, as well as amazing flavors, simply burst from each bite. The light and wholesome broths are a far cry from greasy Asian takeaways and will leave you feeling healthy and nourished, but certainly satisfied. Formerly a street-food stall, owners of Bagel Boy, Mitch Church and Leo Thompson, have now set up permanent shop by Bristol’s St Nicholas Market. The dazzling selection of fillings here can tempt even the most discerning of palates. For outstanding local flavor, why not try Bagel Boy’s peppered cream cheese and locally smoked salmon option? Craft beers, local ales, the retro interior, and the indie tunes, all conspire to make Bagel Boy Bristol’s hot hang-out. Join the city’s young and trendy crowds, and make a beeline for Bagel Boy. The heavenly bagels can also be found at various markets round Bristol. This family-run Jamaican pop-up dishes up platefuls of aromatic Caribbean cuisine, using recipes from their grandmother, the stall’s namesake – Agnes Spencer. With jerk chicken and delicious patties aplenty, if it’s authentic flavors you’re after, look no further than this stall. Forget napkins at Agnes’, the finger-licking goodness of everything on the menu will have you savoring every mouthful. With the meat marinated for a day and a half, you can practically taste the love and passion that go into every plateful here at Agnes Spencer’s. The Cantonese delights at the street food pop-up are home-made from scratch by the stall’s fabulous owners. Using only free-range local meat and the freshest regional vegetables, founder Anita Cheung succeeds in bringing the delicately light and wonderfully natural flavours of traditional Asian cuisine to the streets of Bristol. Forget greasy Chinese takeaways and any mediocre takes on Asian cuisine – Ah Ma’s Dumplings is the real deal. Try the incredibly fresh seafood for a taste of the British waters, enhanced by expert Cantonese flavoring.